Is there any research going on in analysing DNA of human remains to identify their origins? If not why not? I am aware of two major initiatives to analyze DNA from Indus civilization skeletal material. First I would like to say that there are different kinds of DNA that can potentially be harvested from skeletal material. The nuclear DNA is the DNA that codes for the proteins that contribute to who we are and what we look like. The mitochondrial DNA is actually a single-stranded genome we inherit solely from our mothers. It exists in the mitochondria of the cell and numerous copies can be present so it is more often preserved in prehistoric material. This kind of DNA is really useful for looking at the origins of people, their migrations over time, and the relationships between communities because it is only passed down through the mother’s line and it does not recombine the way nuclear DNA does when we inherit it from both parents. Mitochondria DNA can tell us about women’s migrations. There is also a type of DNA that can tell us about male migrations, it is a part of the nuclear genome that is on the Y-chromosome. That DNA is only inherited from fathers. The other two types of DNA we can obtain from skeletons are from sources many people may not have considered: microorganisms and parasites. There can be DNA from microorganisms that persists in human skeletal remains, in the bones, teeth, or even in the hardened plaque (calculus) that remains on our teeth long after death. Microorganisms live in and on our bodies all the time. They make up commensal communities in our oral biofilm, in our GI, and even on our skin and facial hair. Microorganismal DNA is useful to find out about oral health in the past, to address questions about how beneficial microorganism communities change through time or with different dietary and social circumstances, and even to find evidence of past diseases. You may have heard about scientists recovering DNA from the Black Death or historical epidemics of smallpox or cholera. Finally, we can look for evidence of parasite eggs or even possibly parasite DNA in the soil surrounding the burials. So, back to the question of what kinds of DNA work is being done on Indus skeletons. Currently, Dr. Vasant Shinde is working on an analysis of mitochondrial DNA from 4 individuals excavated at Rakhigarhi. The DNA of 2 male, 1 female, and 1 child’s skeleton was compared with samples from a large number of people in South and West Asia. The work has not been published yet so we cannot speculate on the results; however, we do know that they plan to address hypotheses about who the Indus people were, where they came from, and their relationships to contemporary people in South Asia. We know there was a lot of migration to cities during the period of rapid urbanization in the Harappan, or Integration Phase toward the end of the third millennium BCE. We also know there was a lot of emigration from the cities during the post-urban, or Disintegration Phase. They are also testing the soil from burials at Rakhigarhi to see if there is evidence of parasitic infection. If mitochondrial DNA can be recovered, the lab can ensure there is no possibility that modern DNA has contaminated the sample, or if parasite DNA is recovered from soils then we will certainly learn new and exciting things about the Indus people who lived at Rakhigarhi. There has also been an attempt to obtain pathogen DNA from a skeleton from a site in Rajasthan known as Balathal. This is not really an Indus civilization city but more an associated outpost. There was a skeleton buried there that had evidence for leprosy and samples have been analyzed to confirm this diagnosis. Because this specimen is one of the oldest cases of leprosy we have found anywhere in the world, if DNA can be recovered from the pathogen that causes this disease (Mycobacterium leprae), we can learn a lot about the origins, evolution, and early migration of this pathogen in human hosts. Unfortunately, so far Mycobacterial DNA has been recovered but it was degraded and the pieces of the molecule were oo small to say for sure it was from the right species. Hopefully, in the future, pathogen DNA can be studied from the skeletons from the city of Harappa that also show signs of this fascinating and poorly understood infectious disease. At present DNA studies are very popular in western academies, and are one of the most funded line of archaeological enquiry. I am sure that a lot of samples from the greater Indus and the Ganga valleys are currently analyzed in different labs; less sure that genetic evidence will so easily unfold truths on the "origins" of Bronze age Indus communities. A lot of people are trying to recover DNA of bones from the Prehistoric periods in India and Pakistan. So far none of these scholars has reported that any DNA has been recovered that can be used for reconstructing the ancient DNA. The problem is the lack of preservation due to post depositional weathering and the depletion of all organic remains. As far as I know, all Indian genetic work is done on modern population. Within this, group specific genes are identified and hypothesis made of ancient Indians. One reason for lack of data directly from ancient times is that the collection of ancient skeletons etc. has not been studied by biologists (archaeo biology in India is still a field of identifying animal bones etc.). This needs to be done and Deccan College is now beginning to expand in this area. But modern mix of genes etc. are also yielding good results. Work of researchers like Thangarajan etc. from Centre for Cellular and Molecular Biology and other organisations has revealed rich details of the population that exists in India today. 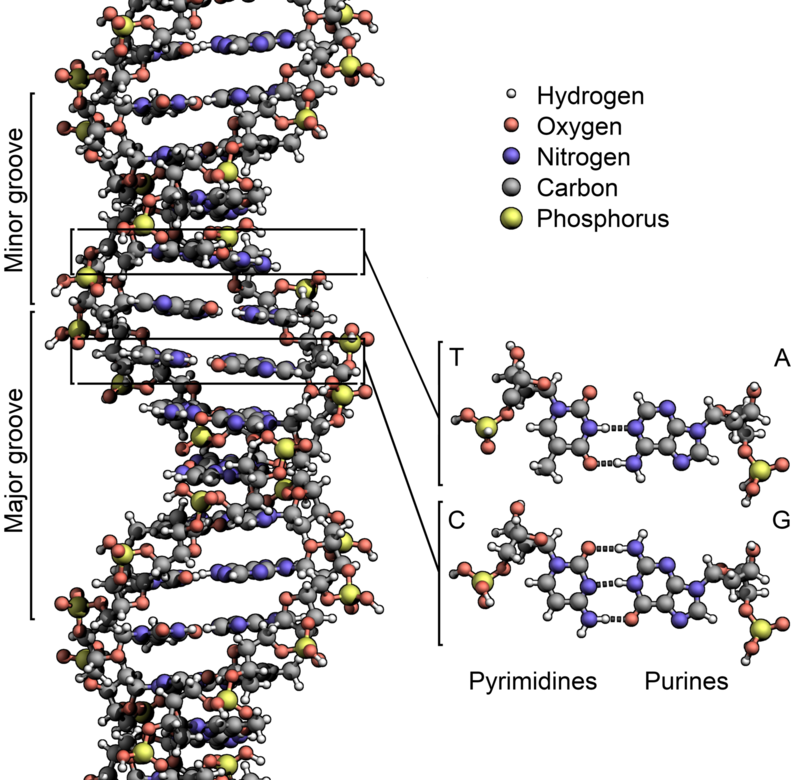 Above: DNA structure, courtesy Wikipedia.